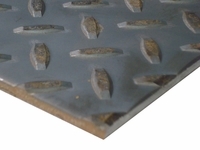 Floor plate is a rolled steel plate with a raised lug pattern on one side. The pattern allows for better traction and slip resistance. Floor plate can be easily fabricated.